There is nothing better than a nice pair of thick flannel pajamas to help keep you warm on a cold winter night. Luckily there are a lot of cute, comfy, and flattering flannel options for women that will keep you super warm, and looking amazing. If you are looking for a pair for yourself or as a gift for someone you love, we have done some substantial research to find the best high quality, seriously warm flannel pajamas. Noble Mount has an excellent reputation for the warmth of its flannels. Their 100% Premium Cotton Flannel Pajama Set is a great option if you want something warm that looks great while lounging or that will keep you warm when you are sleeping. The sets come in a range of cute prints and colors. The material is a 100% premium Cotton Flannel that is brushed, which just means that it has been made softer. These PJ’s come with a chest pocket, as well as two side pockets on the pants. The waistband is drawstring with elastic so that you can adjust the fit. It also comes with contrasting piping, which is a nice little design detail that adds to the overall stylish look of the sets. If you do choose this brand, you should pick your size with the expectation that it will shrink about 5% when washed. Some customers who have bought this set find the rise on the pant is a little short, giving it kind of a low rise feel to it. If you are looking for a gift, Noble Mounts PJ’s come in a beautiful gift box. L.L Bean is another excellent place to get some high quality, thick flannel sleepwear. They have a few different flannel options, including their Scotch Plaids Sets and some different tops and bottoms that you can buy separately. The L.L. Bean designs come in cute patterns and plaids. For the most part, their flannel has a reputation for being thick and warm. 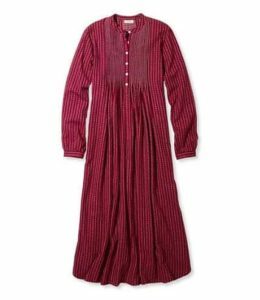 One of their most popular styles for women is their Flannel Night Gown (pictured above). 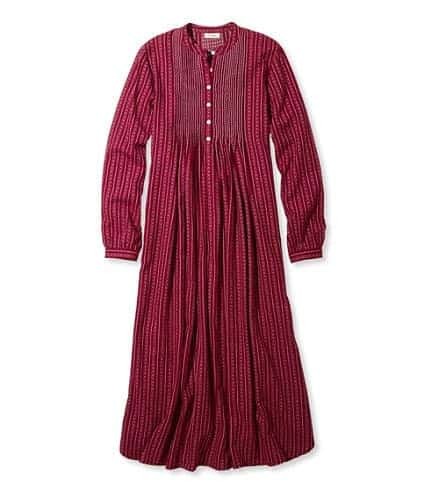 It has been around for years, and if you are looking for comfort and warmth, then this nightgown is a great choice. It is made from good quality fabric and is designed to have a generous loose cut. This durable nightgown will last for years to come. Land’s End has a lot of sleepwear options, and they are known for the high quality and softness of their flannel. Many of their pants and sleep shirts sell separately, so they end up being a little on the pricey side unless you can get them on sale. If you don’t mind the price, they have some pretty cute patterns, including some seasonal Christmas themed options that make great gifts. The flannel on the sleep shirts and pants is super soft and thick. The pants have a tie and elastic waist with pockets on the side, while the shirt is nicely tailored for a woman’s body and isn’t too boxy or unflattering. 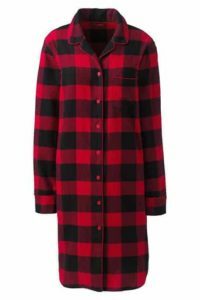 Land’s End also has quite a cute flannel nightshirt (pictured) that I wanted to include just to give a range of flannel options. The nightshirt runs a little small. If you want a high quality, luxury PJ set with a little bit of a different style, look no further than the Garnet Hill- Organic Pima Cotton Flannel Mandarin Tunic Pajamas. This set comes in a few beautiful pattern options with a very flattering feminine, tunic style. The tunic style is a relaxed fit with quite a wide leg, so most women will find the fit to be comfortable. The Mandarin collar is something you don’t see every day on a flannel pajama set, so that adds to the overall sophisticated look of the set. The flannel is an organic Pima cotton flannel that comes from Peru, so it is super soft. It is a lightweight flannel, so if you want a fabric that is very heavy and thick, this is not the set for you. It is more of a fall/spring weight flannel. If you like a more classic style, Garnet Hill also has some regular style PJs that come in pretty floral patterns. A great place to shop for flannel pajamas and nightshirts is Bedheads. They have a good selection of cute and quirky patterns that you won’t find anywhere else. They are the classic men’s pajama-style with a relaxed fit. They have the standard notch collar and button-down front. Bedheads aren’t the cheapest flannel option that you will find, but they are one of the few sleep sets that are made in the USA. Alexander Del Rossa Women’s Flannel Pajamas are a lightweight PJ that comes in pre-shrunk cotton flannel, so you don’t have to worry about shrinkage when you wash the set, which can be an issue with other brands. The Alexander Del Rossa set has an elastic waist but does not have the drawstring for adjustments. These are a relaxed fit so that they will be comfortable for most women. The top is a little longer than what you usually get on women’s flannel PJs. Some women like the bigger fit on the top, others who are looking for a more flattering fit don’t like it so much. Overall they are a great budget option that most women will love. Some of the warmest flannel options can get a little pricey, so I wanted to include a few picks that are warm and comfortable, but that won’t break the bank. One option is the bSoft Bamboo Flannel Classic Button Up Pajamas. 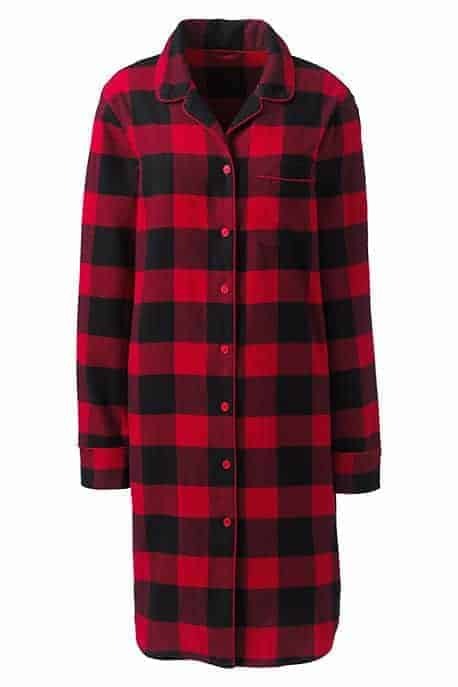 They are inexpensive, yet still have a lot of the features that make a flannel pajama great, including being very soft and cozy. They have an elastic drawstring waist so that you can adjust it for comfort; they also have side pockets on the bottoms. The flannel is thick and soft, and they come in a nice variety of patterns and colors. Inseam Length– If you have had trouble in the past with the length of the pant on pajama sets, measure your inseam and check the measurement of any PJ’s you are considering getting. Check if they are low rise– A design issue that seems to be a bit of a problem with some sets is that the rise is short on the bottoms, so you end up with a pant that is low rise. It is excellent for some body types, but not comfortable for everyone. Check reviews to see if this is an issue on styles that you are interested in buying. Durability– Obviously you will want a pajama that is going to last through a lot of washing and wear. Most cheaper brands won’t last you more than a year or two. If you want a set that is made to last, try L.L Bean or Land’s End. The thickness of the Fabric– If you buy a pair of flannel PJs assuming that they will be warm just because they are flannel, you may be disappointed. The weight and thickness of cloth vary quite a lot, so if you want heavyweight, warm sleepwear, you will need to double check that the flannel is medium or heavyweight with a reasonable amount of thickness. Cost– The cost of flannel sets can range from $30 to well over $150. The more expensive brands should last longer due to better quality materials and manufacturing. The more heavyweight flannel also tends to be a little more expensive. Fit– Most women’s PJs are quite fitted. You can usually find the type of fit in the description of the set. If you love a relaxed fit and are having trouble finding something in women’s, you always have the option to look at the men’s styles. They are often a little more boxy and loose. Pockets– A nice-to-have feature on a set of PJs is a pocket. Many brands offer a chest pocket, but not so many have pockets on the pant. If you are looking for a sleep pant with pockets, you can try Noble Mount, Land’s End or the bSoft Bamboo set.